In honor of my aunt Shirley who passed away last week, I’m re-posting one of my most popular blog posts. I hope you enjoy. 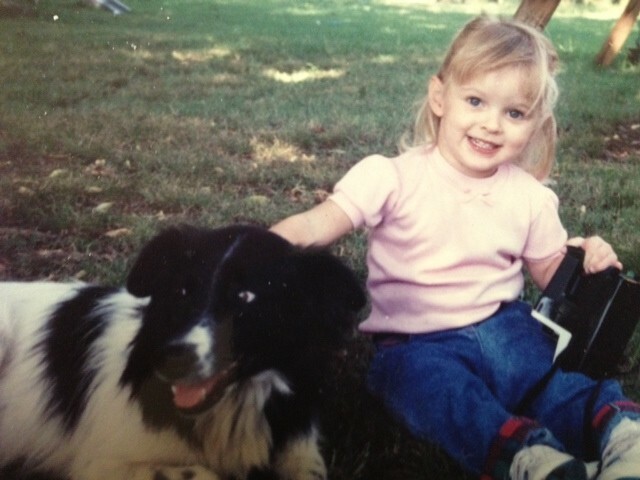 My daughter at a young age along with our dog, Preacher. We quickly discovered she had no owner, and we were lucky enough to keep her for our pet – and we kept her rather unusual name. Preacher had been well taken care of and knew all of the standard dog tricks. She quickly became a favorite with everyone at the church. However, as I’m sure you can imagine, working at a church and having a dog named Preacher can often cause some confusion. For example, when she became sick, I caused quite a stir when I told people we had to put Preacher in the hospital. The congregation was ready to send flowers to their pastor until I explained it was only our dog who was sick. But this mix-up was mild compared to the problems Preacher caused for my mom, Carolyn. When my family and I moved about a year later, we had to take an apartment that didn’t allow pets. My parents, being the wonderful parents they are, agreed to keep Preacher. They quickly became attached to the dog. So it was with some sadness when my mom called me to tell me Preacher had been killed when she was hit by a car. But in addition to calling me, she also called her sister, Shirley. At this point, I’ll let Shirley tell the rest of the story as she told it to me. Your mom called me the other day just a ‘crying and said, “Our preacher has been killed.” Well, the first thing I thought of was Brother Guthrie at the church and his poor widow and their two kids. I just couldn’t believe it. How did it happen, I asked. “A car hit him,” said my mom, still crying. “No, he was probably running,” my mom said. Well, I knew Brother Guthrie used to jog, but I thought he had quit. “Well, where did it happen?” I asked. “I think he was probably chasing a squirrel,” said my mom.